When homeowners start even the most minor renovations, a number of risks could be just around the corner. With insight on common exposures and the dangers of going without remodeling builders risk insurance, you’ll understand why it’s important to the financial well-being of your personal lines clients. Who needs home remodeling insurance? Who is doing all this renovating? What if your client wants to remodel without a home remodeling policy? How can you get clients on board with a home remodeling policy? 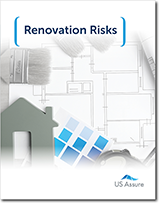 Complete the form now to access our free resource and get insights to help you secure remodeling builders risk policies for homeowner clients today.